ASCENDING A GRADIENT OF 1 IN 25. A “Beyer-Garratt” articulated locomotive owned by the Burma State Railways hauling a heavy freight train round a 337 ft radius curve. The railways in Burma have over 400 locomotives, including the most powerful types used on metre-gauge lines. 6-in as against the standard 9 ft 3-in. Bogie coaches up to 56 ft in length are used. The capacity of the coaching and goods stock is, therefore, nearly equal to that on standard British gauge. It is also obvious that Burma Railways 100-ton loco-motives, capable of developing a tractive effort of 41,000 lb, and hauling trains of 200 tons up long 1 in 25 gradients with almost continuous 330 ft radius reverse curves, can be run only on a line that is well laid, equipped and maintained. And, indeed, the general standard of the lines in Burma is comparable with that of many systems of wider gauge. Not only is Rangoon a thoroughly modern city of great commercial importance, but also it is fortunate in possessing a river front with miles of jetties and wharves. Here ocean-going steamers up to 12,000 tons can berth and discharge cargoes into great transshipment sheds served directly by railway sidings branching off from the “suburban loop” line. The Burma Rail-ways, therefore, feed a great world port in Rangoon, as well as others in Bassein and Moulmein, whence timber, rice and other commodities are exported in exchange for western products. Rangoon is thus a busy railway centre for goods traffic, and it is only necessary to quote the following facts to show what a heavy passenger traffic it also commands. As well as the main or central station, Phayre Street, there are over twenty stations in the suburban area, and at Phayre Street over 150 trains, arriving or departing, are dealt with daily. Between 5am and midnight a train arrives or departs on the average every seven or eight minutes, while during the business rush hours the interval is considerably shorter. Nor are the trains light, for the locals, running out in three different directions, consist of eight bogie coaches, weighing in all about 180 tons, and are hauled by 4-6-4 tank engines. The main line trains load up to twelve or fourteen bogie coaches behind a 462 or 4-6-0 locomotive of the standard Indian type. 2,056 MILES of the metre-gauge track in Burma are State-controlled. 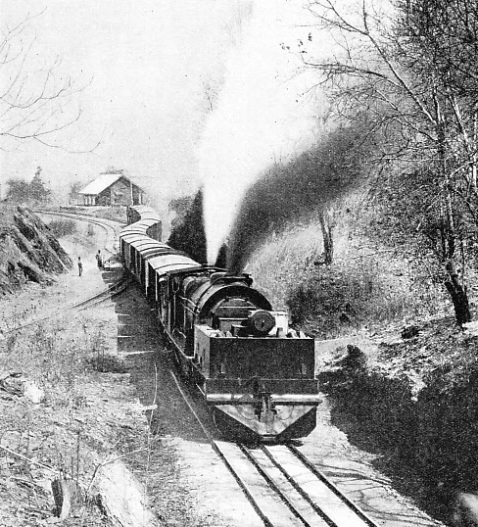 The first railway was opened in 1869. Phayre Street Station is a fine modern structure, having seven platform laces. Its facade, overlooking wide approach roads bordered by well-kept lawns, is 738 ft in length, and is remark ably attractive from the architectural point of view. The main station buildings are parallel to the platforms, for this is a “through” and not a terminal station. Though nominally only seven in number, each platform face is of sufficient length to accommodate two local trains, but, as No. 1 platform is used by main line trains only, there are, in effect, twelve platforms available for local trains, which form the great bulk of the traffic. The local services run out to Insein, or Wanetchaung, on the Prome main line, to Cantonments on a branch line, and to Thingangyun on the Mandalay main line A feature of the Phayre Street Station is its comfortable rest or retiring rooms, situated above the European refreshment room. The passenger station yard is controlled by three principal signal boxes, two of which have about a hundred levers each, and the third about seventy-five The Western Electric system of train control is installed throughout the Rangoon area, and interlocking is very complete. All signal lamps are electrically lit. from and distribute traffic to the “suburban loop”, which runs the whole length of the wharves and jetties along the Rangoon River frontage of the city. A large number of rice mills and timber sidings along the river front, and on the Dawbon branch are also fed by these two concentration yards. 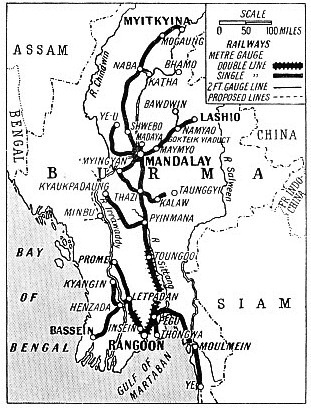 The accompanying map clearly shows the main lines out of Rangoon. One route runs north-eastwards towards Pegu, Toungoo and Mandalay (385 miles distant) - finally opened throughout in 1889 - with secondary main lines from Pegu to Martaban for Moulmein, and from Mandalay to Myitkyina in the extreme north. Another route proceeds north-westwards to Letpadan for Bassein, Henzada, and Prome. 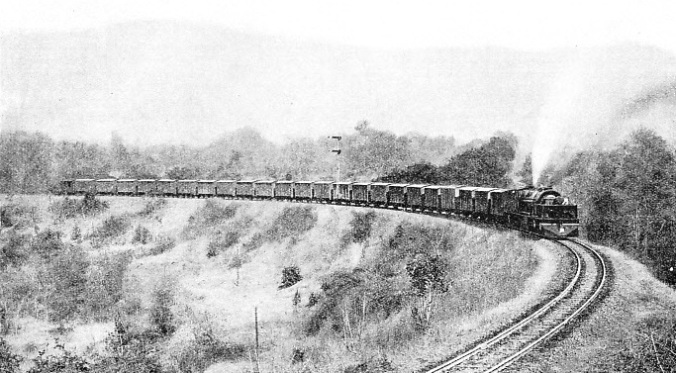 This was the first railway laid in Burma, and it was opened in 1869. The Mandalay main line also has numerous important branches, some of them over 100 miles in length. The fact that more than 200 miles of the main line are double is an unusual feature for a metre-gauge railway. The recent bridging of the great Irrawaddy River near Mandalay made possible a continuous train journey of 725 miles from Rangoon northwards - or nearly 900 miles from Prome via Rangoon - without having to cross the river by ferry, as was previously necessary. Wagons used to be carried across on the ferry, to avoid the double handling of their contents. Similar wagon ferries are still in use between Martaban and Moulmein - whence there is a long branch line southwards to Ye - and also between Letpadan and Henzada, where another isolated section of line serves the important seaport and town of Bassein. THE MAIN STATION AT RANGOON, Phayre Street, possesses seven platforms. Over 150 trains, arriving or departing, are dealt with daily. No. 1 platform is used by main line trains only, and the other platforms are long enough to accommodate two local trains at a time. Rangoon Station is a busy railway centre both for passenger and freight trains, handling long-distance expresses as well as a heavy suburban traffic. The vast structure which replaced the wagon ferry across the Irrawaddy at Sagaing near Mandalay is called the Ava Bridge, taking its name from an ancient and now deserted capital of Burma near at hand. This bridge consists of nine spans, each 350 ft in length, one span of 250 ft, and six spans of 60 ft. The structure carries two roadways as well as the railway. Each of the 350 ft spans weighs 1,020 tons. The foundations consist of steel caissons 59 ft long and 29 ft wide. These are anchored in rock at varying depths down to 104 ft below bed level. There is a 40 ft seasonal rise and fall in the river level, and a 40 ft headway is allowed for steamers passing under the bridge in high flood. The piers are heavily reinforced to resist earthquake shocks. Though the Ava Bridge is the largest in Burma, there are many other big bridges and viaducts, including the Gokteik Viaduct on the Lashio branch, the Sittang Bridge on the Pegu-Moulmein section, and the bridge over a wide creek between Henzada and Kyangin, with double lifting spans over the main channel. Apart from the particularly interesting articulated engines already described in the chapter, “Hill Lines of India”, beginning on page 826, the principal types of locomotives on the Burma railways are the 4-6-2 and 4-6-0 main line passenger engines, the former having a tractive effort of 19,700 lb. Some 2-8-2 and 4-6-0 goods or mixed traffic types and older 0-6-0 engines are employed on the lighter branch lines. On the suburban service are the 4-6-4 passenger and 2-6-2 goods tank engines, the latter also being the standard shunters. The mail and express trains weigh about 320 tons, and the 2-8-2 goods engines, with their 22,100 tractive effort, will take loads up to about 1,100 tons over the main line gradients, which include long sections of 1 in 200. The locomotive workshops are situated at Insein near Rangoon, and there are twenty-three running sheds on the system. The permanent way consists of flat-footed rails weighing 60 lb per yard on the more important main lines, 50 lb on the secondary lines, and 41¼ lb on light branches. On the 1 in 25 section of the Lashio branch beyond Mandalay 75 lb rails are used. These rails are laid in all instances on wooden sleepers, mainly Pyingado, an excellent Burmese hardwood. Ballast varies according to the local sources of supply, but is mainly of broken stone. There are stated to be nearly 400 miles of sidings on the system, a large percentage of them being in and near Rangoon. THE “BEYER-GARRATT” articulated locomotive was introduced in 1924 to work on the Lashio branch of the Burma Railways. The type was, at the time, the most powerful in the world working on the metre gauge. The section operated by it includes lengths of continuous reverse curves of 330 ft radius, and eleven miles of 1 in 25 gradient. on the double line, and about forty double-line stations are interlocked on the key and tappet system. Some twenty junctions and important stations have fully-interlocked cabin locking. On most branch lines the stations are not interlocked, facing points being secured by cotters and padlocks, the keys of which are kept in the custody of the station-master on duty. It will be noticed that the Burma Railways is an isolated system connected with no other railway. But among the extensions to the Burma Railways that has been surveyed from time to time are three main Indo-Burma connecting routes, and also connexions with the Royal State Railways of Siam. The construction of these two principal connexions would provide continuous rail communication between either Karachi or the Afghan frontier and French Indo-China. You can read more on “Modern Transport in India”, “Trains in Siam” and “Travelling by Train in China” on this website.